Happy New Year! Since 2018 is already underway, allow me to give you an update on what is happening at the Center. This spring, over 260 colleges are administering CCSSE and more than 160 will also be adding the Center-created special-focus item set on academic mindset. We are excited to hear what students’ perspectives are on this topic. 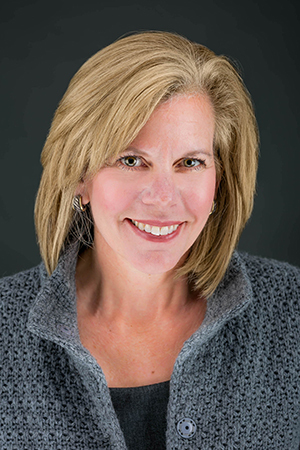 In addition, as more colleges are redesigning for guided pathways and are looking for examples of project-based collaborative learning, applied learning, and faculty-led improvement of teaching practice, the Center has added six open-ended items to CCFSSE in an effort to elicit examples of such teaching strategies from instructors. We are excited to see what instructors are doing and to share the information with the field. The Center has also recently partnered in the California Guided Pathways Project. The project, funded by a grant from the College Futures Foundation and The Teagle Foundation to the National Center for Inquiry & Improvement (NCII) and coordinated by the Foundation for California Community Colleges, will help community colleges design and implement structured academic and career pathways for all students. This new work follows the completion of the national guided pathways work, which was led by the American Association of Community Colleges (AACC), in partnership with seven other organizations including the Center. The final institute (in pictures below) of the national project was hosted this past October in Seattle. As the spring conference season kicks off, I hope to see you at one of the Center’s sessions. We’ll be highlighting the work of our latest report (to be released February 13) on academic advising and planning. I look forward to hearing what your college is doing to improve the lives of students and ensure that they are successful. See you soon! Eighty-six percent of Community College Survey of Student Engagement (CCSSE) respondents say that an advisor explained which classes they needed to take in order to reach their academic goals, and 65% report that an advisor helped them develop an academic plan. Yet, only 53% report that an advisor spoke with them about commitments outside of school. To delve more deeply into advising and its impact on student engagement, the Center added 20 additional items to the 2017 administration of CCSSE and 12 additional items to the 2016 administration of the Survey of Entering Student Engagement (SENSE). Next month, the Center will release a national report, Show Me the Way: The Power of Advising in Community Colleges, highlighting the findings from these data collections. The report will explore how advising’s structure, content, and intensity help shape the student experience. Along with the quantitative data the report will present, qualitative data will also be included in the form of student quotes. 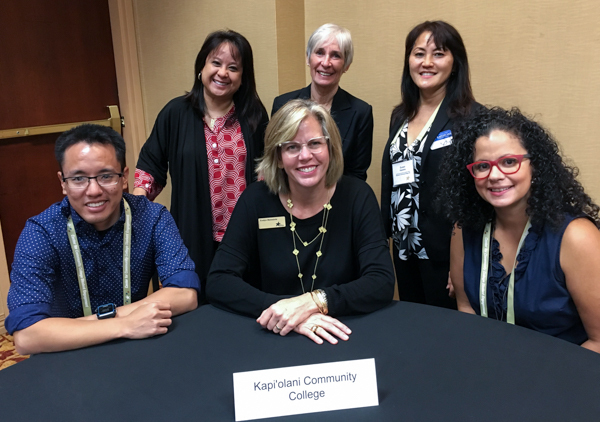 The Center—through generous funding from The Kresge Foundation—conducted a series of focus groups with students and academic advisors at three community colleges to provide the student and advisor perspective on this important student service. In addition to the incorporation of relevant quotes in Show Me The Way, video clips of these focus groups will be added to the Center’s YouTube video library in February. The Center’s YouTube library contains a wealth of student and faculty voices on topics from academic goal-setting to developmental education. The report release will include two focus group discussion guides that can be used to capture student and advisor voices around this topic. Come engage with Center staff as we present on the report at the following annual spring conferences: AACC’s Convention, DREAM, and Innovations. Has a staff member at this college talked with you about which credits will transfer toward your intended program or major at the four-year institution of your choice? At this college, are you required to follow an academic plan that specifies which courses you are required to take? If you were interested in changing your program, major, or pathway of study at this college, do you know how to go about doing this? See the complete 12-item SENSE module here. Registration for SENSE 2018 is currently underway. Please contact info@cccse.org with questions. Each year, Santa Barbara City College (CA) faculty and students nominate a faculty lecturer to deliver a lecture to the College, usually on a topic related to the professor’s discipline. Over the years, we’ve heard lectures on everything from the Golden Ratio and the evolution of Spanglish to the virtues of the monarchy. So as the 2013 faculty lecturer, and as an English professor, I faced a dilemma. I, too, could pick a topic in my discipline, or I could use this as an opportunity to give my students a voice. The first option bored even me, so as a starting point, I went to the website for the Center for Community College Student Engagement and searched through national survey results for both entering and continuing students. What I found allowed me to frame my lecture, to capture students’ perceptions of their college experiences and their expectations of us as teachers and of our institutions. It provided me with a picture of our students that both contradicted and reinforced our own perspectives as educators. Survey results showed that most students had a high degree of motivation. Then why did these highly motivated students drop out? Student comments from focus groups showed that what we sometimes see as lack of engagement is often a fear of failure, confusion about expectations, and a sense that they don’t really belong on our campuses. What are the implications of these perceptions for those of us in the classroom? How do we confront or change them? Again, the student responses to the Center’s surveys, along with student responses in interviews and focus groups from Student Support (Re)defined, provided the answers. Time and again, students underscored that the ways faculty taught, challenged, encouraged, and engaged them, both during and outside of class, made a critical difference in helping them succeed. Now I had a framework, a wonderful collection of student comments and observations, but how could I present these student voices authentically? The answer was clear—I needed real students to deliver my lecture. I went to our Theater Arts classes and recruited some wonderful student actors. We set up desks on the stage, and the students easily became the student voices from the surveys and interviews. They even commented on how natural it felt, how they, too, could relate to what these other students were saying. So, while I provided the context, these students became the focus of “my” lecture. And they were brilliant—so brilliant, in fact, that our president asked us to repeat the lecture/performance for the all-campus in-service the next fall! 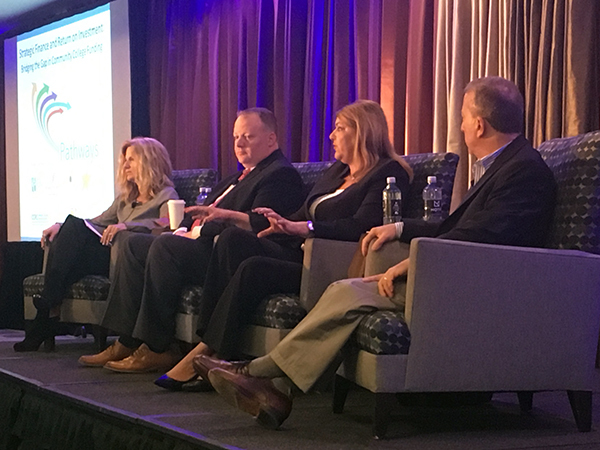 The Center hosted the 2017 Student Success Institute: Intersecting Pathways With Engagement November 2-4 in Austin, Texas. Fourteen colleges from 12 states sent teams to the Institute to explore how their CCSSE and/or SENSE data intersect with the Pathways Model in order to better understand student experiences and the journey to college completion. Participating colleges included the following: College of Menominee Nation (WI), GateWay Community College (AZ), Kapi’olani Community College (HI), Lorain County Community College (OH), Milwaukee Area Technical College (WI), Muskegon Community College (MI), New Mexico Junior College (NM), Pellissippi State Community College (TN), Polk State College (FL), Skagit Valley College (WA), Stanly Community College (NC), Wayne Community College (NC), West Virginia Northern Community College (WV), and Western Nebraska Community College (NE). 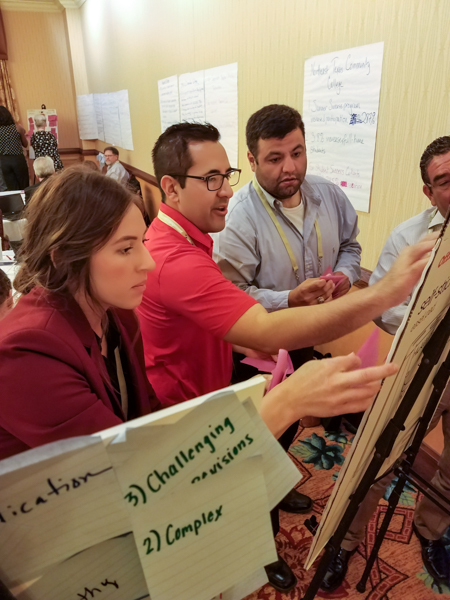 The Institute was a 2½-day intensive, hands-on learning summit that provided cross-functional college leadership teams with an immersive opportunity to analyze their survey data and make plans for meaningful progress in implementing the Pathways Model on their campuses. College teams engaged extensively with Center staff, Resident Faculty, and nationally recognized presenters. Teams also developed a customized short-term action plan, which includes actionable “next steps” to support their ongoing work toward implementation of a data-informed and evidence-based student success agenda. 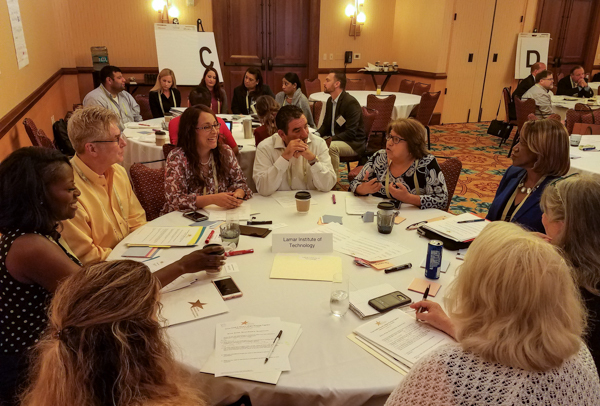 The Center hosted the reconvening of colleges participating in the Texas Small & Rural Colleges Working Together project on November 6, 2017, in San Antonio, Texas. The purpose of this project is to support the development of data-informed institutional improvement of 15 colleges that participate in CCSSE as the Texas Small Colleges Consortium. Acknowledging that small and rural colleges frequently do not have the infrastructure and resources to focus on implementing and sustaining a culture of evidence, the project work seeks to increase these capacities in order to enhance students’ preparation, access, persistence, and completion rates. Participating Texas colleges at the convening included the following: Clarendon College, Coastal Bend College, Howard College, Lamar Institute of Technology, Northeast Texas Community College, Ranger College, Southwest Texas Junior College, Texas State Technical College, and Western Texas College. Team members from various colleges collaborate on workshop exercises. By administering CCSSE and SENSE, colleges significantly enhance their ability to make data-informed decisions at the institutional level. To assist member colleges in gathering meaningful course-level information, the Center provides CCSSE and SENSE Course Feedback Forms. The content of these forms is based on Center survey items and is intended for local administration and data analysis. This tool can be used by college leadership to collect additional student engagement data as well as by individual faculty members seeking to assess engagement practices in their own classrooms. The CCSSE Course Feedback Form asks students about their experiences throughout the academic term, so the Center recommends that it be administered at the end of the term. Because the SENSE Course Feedback Form asks students about their early experiences in the course, it should be administered in the 4th or 5th week of the academic term. Both the CCSSE and SENSE Course Feedback Forms are relatively short and should take students less than 10 minutes to complete. They are available free of charge in the tools sections of the CCSSE and SENSE websites.